FINALLY! 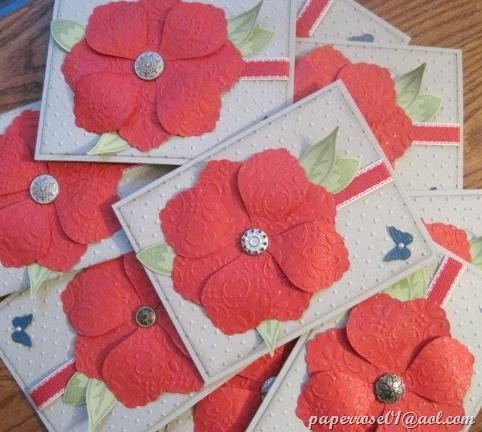 My 24 cards for the Stampin’ Up Demonstrator swap are DONE and went out in the mail yesterday. The colors I used were Sahara Sand, Poppy Parade, a touch of Not Quite Navy and Certainly Celery for the leaves. I had 24 cards to make and I had EXACTLY 24 Antique Brads left in my container. The red petals and the butterfly were sprayed with my Home Brew (Rubbing Alcohol + Glimmer Mist) so there was lots of sparkle! Now it’s time to come up with a make-n-take or two for our July 16th Catalog Kickoff/Open Stamp Day. Stampin’ Up announced 5 new in-colors for the 2011-2013 year so perhaps we will do our make-n-takes with the newest in-colors. I know Sheila will be happy as one of the new colors is Wisteria – a beautiful shade of lavender. If you are unable to attend a stamping event and wish to purchase a kit, please let me know by 12 N on the Saturday of the event. As always, we will do 4-5 projects for each stamp camp and the projects will be posted on my blog sometime during the week preceding the stamp camp. 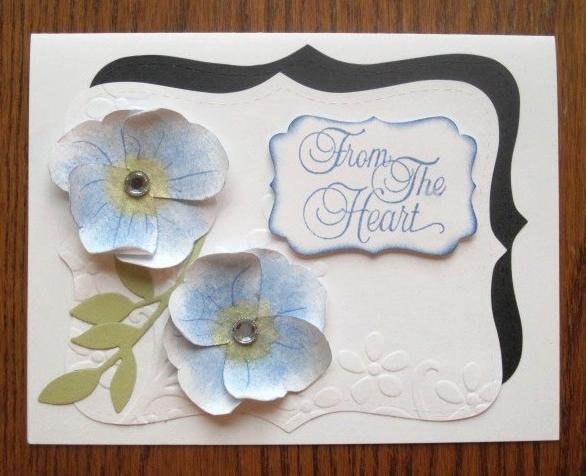 A few more cards I wanted to share from our fellow stampers: Pansies punched by Andrea. The butterfly punch gives you this pansy shape; a mist of water will bring the natural curl of the petals. Sponging and fine lines with a marker adds the coloring. 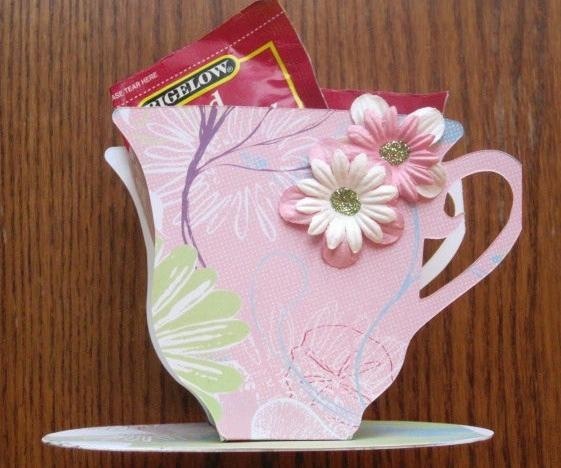 Don’t you love the Judy’s teacup complete with teabags! This would be a perfect handmade gift for someone under the weather or even a little thank you. Remember the box we made in May? This is Judy’s version. She punched out the center front and added a window sheet before putting the box together. 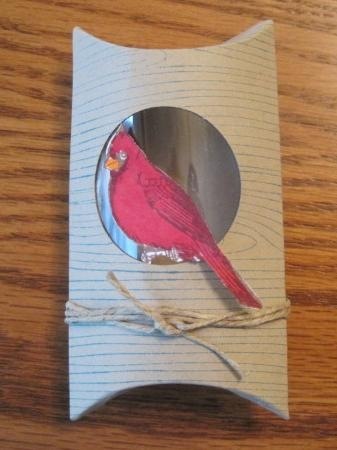 Then she added a die cut bird and a bit of natural hemp. This would be cute with colored shreds peeking through the clear window. I also want to share our new addition out the patio door! Perhaps on a windless day, we could even stamp outside! 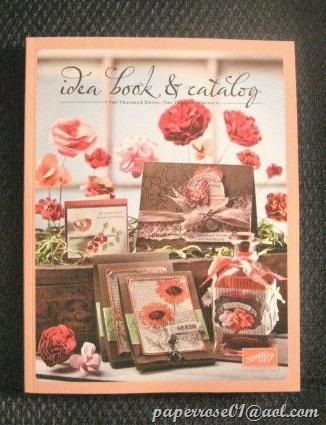 Monday June 20, 2011–The New Stampin’ Up Idea Book and Catalogue is here for you! FINALLY! I can announce the new 2011-2012 Stampin Up Idea Book and Catalogue is ready to place is your hands! Although we have had the books for several weeks, we were told they could not be released until June 20th! If you hear someone say the books are not available until July 1, that is a mistake. The books cannot be SOLD until July 1, but as we no longer charge for the books, ours can be released now! SO, how do you get your book? 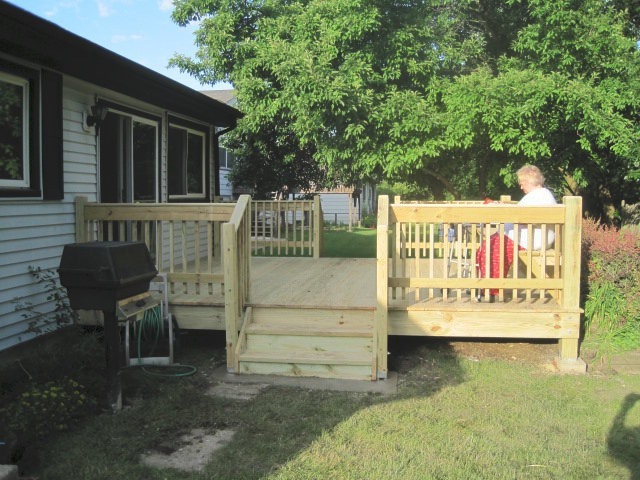 Well, you can stop by any time and pick it up – just call in advance (630-759-3089) – OR – you can stop by on Saturday, July 16th, create a make-n-take, view all the stamps, etc. I will be selling in my garage sale on July 22, 23 and pick up your catalog – OR – I can mail your catalog, although there will be a charge for shipping. Several of you have orders you have placed and I will put your catalog with your order. NOW is the time for you to host a book party or workshop. The new hostess plan is explained in the new book. I really like the new plan as instead of being limited to a few stamps as a hostess award, you are given dollars to spend on anything. PLUS, there are a limited number of stamp sets that are available to the hostess at a reduced price. Check it out and let me know if you wish to have a workshop at your home or mine – or if you wish to host a book party. As I mentioned above, we are having a garage/craft sale on July 22 and 23. If you have stamp sets, cards or paper crafts you wish to sell, please let me know. We can provide a table for you in our garage and you can sell away! If you are interested in purchasing the sets I will be selling, they will be out for you to view on July 16th AND I will give you a 10% discount on anything you purchase! What a deal! Debbie and I did a major clean out of older stamps and I will be selling quite a few! You should see my empty shelves! This is Judy’s interpretation of our June Build-A-Blossom card – and I just realized it is UPSIDE DOWN but it is still beautiful. 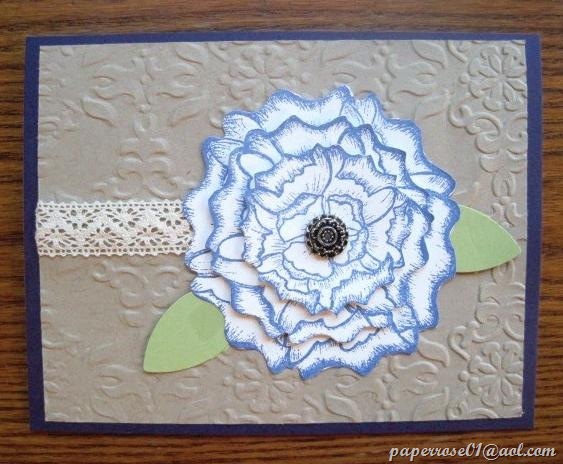 Judy used a non-Stampin’ Up stamp set and die and tied it together with the antique brad. Judy gave me the name of the stamp set and die she used, but I can’t find the information now. I know she would be happy to share the names of the items she used! In May, I shared some cards Andrea had made using assorted punches. These were originally created by our fellow stamper Kathy Moodie. Andrea scanned the cards on her computer and then recreated them. 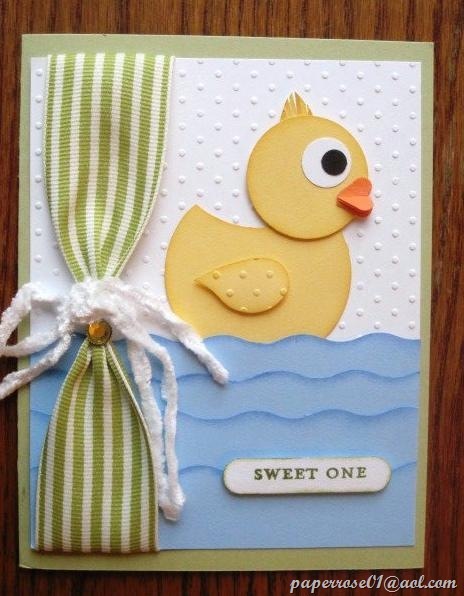 Yellow Ducky is a cutie and perfect for a baby shower or a new baby. It is amazing what you can do with circle and heart punches. The wing of the duck and the pouf of hair are from the bird punch wing. Our 1 1/4” striped grosgrain serves as the shower curtain and softly scalloped “water” becomes waves. I will be announcing the Stamping Calendar for the remainder of the year later this week, so please check back. 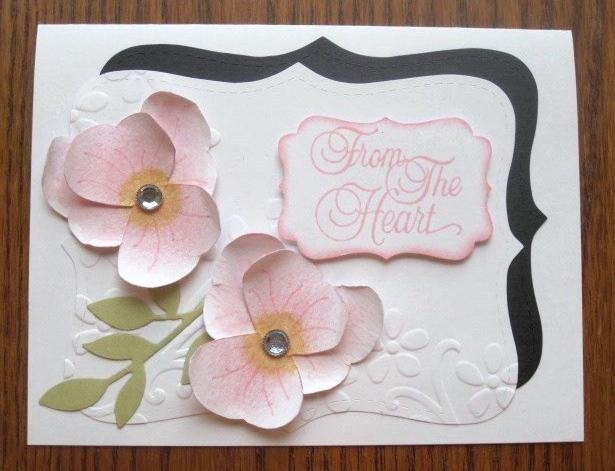 Plus, I will be sharing some additional cards made by our stampers. Right now, I am in the middle of 24 cards I am doing for a demonstrator swap. My color scheme is Sahara Sand, Poppy Red and a touch of Not Quite Navy. I will share a card with you later this week. Right now I am finishing up all the embossing. The paper is cut, but I have a been of embossing left.